New Jersey will be holding its Seventh Annual Disability Pride Parade and Celebration in Trenton this month. 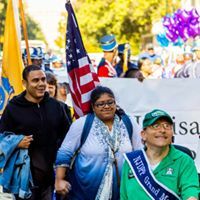 The event is organized by the Alliance Center for Independent Living based in Edison, and I’m proud to have been a part of the parade since the beginning. I have told this story many times, and the underlying philosophy remains important to emphasize each year. I have recruited people with disabilities to march in past parades. One year my neighbor sarcastically asked me: “Are you proud of that stutter of yours?” Since I’m always reminding him that he cannot see too well and that he is dangerous in a power-chair, his well-aimed barb is routine banter between people comfortable with their disabilities. His comment, however, started me thinking about the incongruity of pride and disability. It is incongruous to take pride in not being able to do something. There must have been some onlookers at the parade in the past asking: What are these “broken-down people” with crutches and in wheelchairs doing marching around proclaiming their pride? How can they be proud when they can’t do anything for themselves?